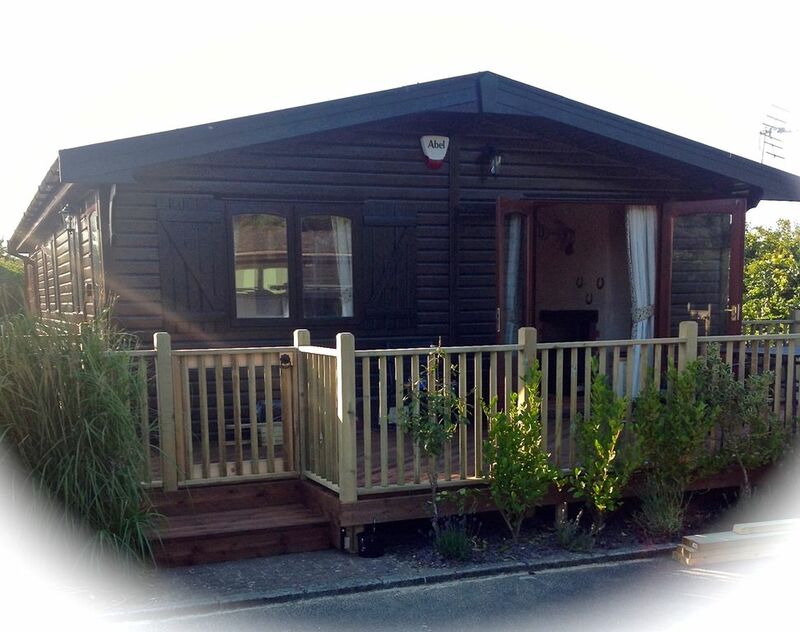 Welcome to Our holiday home which is a 2 bed - 6 berth very cosy Log Cabin in a very quiet part of the park. 100yards away from a well stoked carp fishing lake. You must have a license to fish here and bring your own equipment. Our cabin is different from the rest – it has a very large main bedroom, 2 double wardrobes, dressing table, set of drawers and blanket box and television . The en-suite has a large walk in shower. Bedroom 2 has two single beds, bedside table and fitted wardrobe. The Kitchen area has fridge freezer, dishwasher, gas hob, George foreman, microwave, toaster, kettle etc.. It has a small oven/grill – I always believed when on holiday not to spend time cooking! There is enough equipment to make light meals and breakfast. Shorefield Country Park is a fabulous 5 star rated holiday park set in 100 acres of delightful landscaped parkland. It's a perfect location positioned between the New Forest which is home to all those ponies, donkeys and deer just a short drive. and a 10 minute walk to the beach with views to the Isle of Wight and the Needles. Our holiday accommodation is ideal place to relax in or to use as a base to explore. Attractions including Beaulieu Motor Museum, Hurst Castle, Paultons Park, Peppa Pig World are all close by. Nearby is Bournemouth and its famous sandy beaches, piers and attractions. Situated on the southern edge of the New Forest, with the nearby towns of Lymington, Brockenhurst, Burley, Keyhaven and Christchurch the park is the ideal location to explore this beautiful part of Hampshire and Dorset. The park has great entertainment for all ages and an indoor and out door swimming pools. Nearby are golf courses, horse riding stables, nature trails, cycle routes and fishing all in beautiful surroundings. There is lots to do locally with the attractions of Beaulieu, and the famous motor museum only a few miles away and Peppa Pig World at Paultons Park is also nearby for fun days out. At Shorefields there are two Swimming Pools on the park just for relaxing in the large indoor leisure pool with a shallow area for children to splash about. There is also a luxurious spa bath, a relaxing jacuzzi, a steam room and sauna. During the summer months (weather dependant) the heated, outdoor pool is also open with sun loungers laid around the pool to help you relax. There is a gym for those who wish to do some exercise along with the tennis courts, play areas located in the park which have slides, swings and climbing frames. Indoors there is an arcade which provides hours of fun and entertainment for all ages. A well stocked Supermarket also has fun games, activities and DVD's available for those looking to relax in their own space. We have owned this cabin for 5 years and still we never get bored of things to do. Our cabin is a little different to most. It has a very large main bedroom with two double wardrobes, dressing table, set of drawers and television. The large living area has a very cosy gas log burner, double settee and a corner settee which is also a double sofa bed. The kitchen area has new built in kitchen units. Dishwasher, large fridge freezer, microwave, small oven/grill, Toaster, etc. Our cabin is Double glazed with central heating. New patio and front doors. Our cabin is in a quiet area of the park but still can have all the entertainment that you want. 2 mins walk to the fishing lake which is well stocked, a 15 mins Walk to the sea and a short drive to the New Forest. Great pubs for food where dogs/children are welcome. There is so much to do in the area to suit all. The living room has 2 large leather settees - one of which is a double bed settee. Coffee table and matching television unit. 45" television, DVD player and playstation with games. Kitchen has fridge freezer, dishwasher, gas hob, George foreman, microwave, toaster etc.It has a small oven/grill – when on holiday no need to cook! Had a lovely time with my partner and dogs. Such a lovely cabin with everything you need. Would highly recommend coming here. Very nicely presented accommodation, great location and everything provided that you would need. Just wish we could have stayed longer! Shorefield country park is lovely. Cabin was outstanding. Julie has thought of everything. I am pleased you enjoyed our cabin and Shorefields. We stayed in Julie's log cabin for a week in October and had a great time. The cabin has everything you will need, is deceptively large inside and immaculately clean. We really appreciated the amount of space in the master bedroom and it's en suite. We have twin daughters and the room easily accommodated two travel cots and still had space for us to move around. The cabin is in a quiet part of the park which has not been overdeveloped, is close to the lovely beach in Milford on Sea and within a 30 minute drive to all the attractions the new forest has to offer. We highly recommend the property for those seeking a break in the new forest. I went for the weekend with girlfriends. It was perfect. A stroll from the beach with good amenities also nearby. Cabin was clean and well equipped. Thanks Julie. We have had a lovely stay, the cabin is in a great location, easy to get to all the top places or just stay quiet locally. The Cabin has all you need for a short stay, its comfortable, warm and quiet. Its an easy walk to the cliff top.Please can we come back?